Sometimes, even the most familiar places hold pleasant surprises. Sometimes, even the most well-laid plans take a different turn. That’s what makes life—and adventure—exciting! Although Sweetie and I are sticklers of planning, we do live for such excitement. 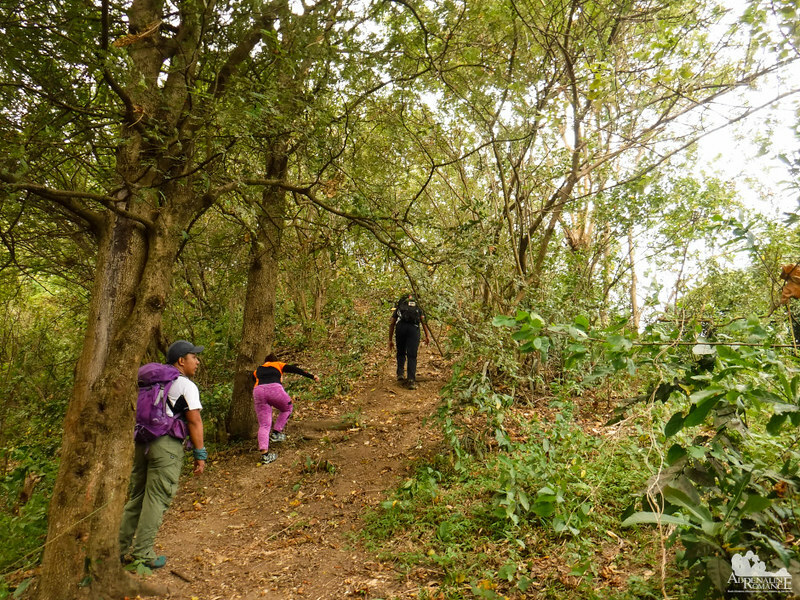 That excitement happened during a recent weekend climb on Manggapares Trail on Tagaytay Ridge. Sweetie, our friend Halourd, and I decided to ask Sir Jing to guide us on a practice climb. 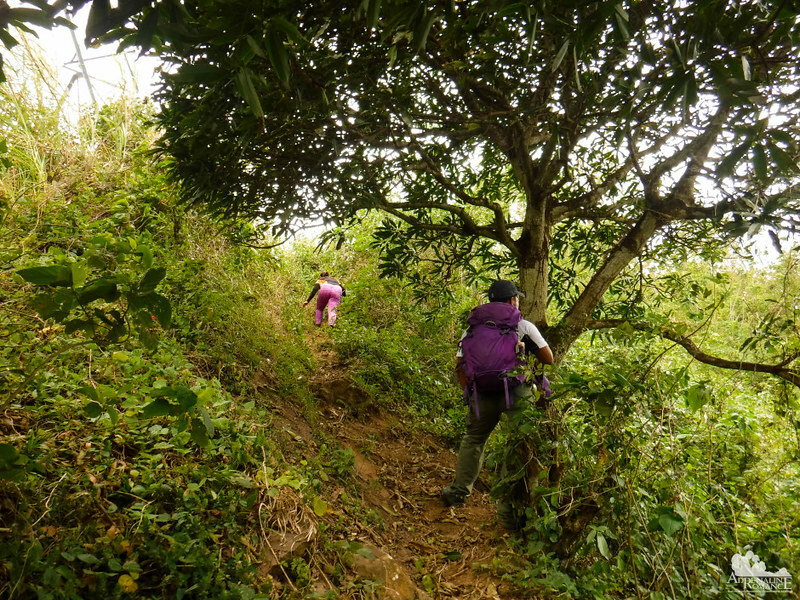 This hike was done in preparation for an upcoming major climb in Bakun, Benguet. Sir Jing thought for a moment and agreed to guide us on a steep, less visited trail somewhere in the Babag Range, which is his playground. It was still a little over 7 AM when we reached our jump-off point in Sitio Napo, Guadalupe. After crossing the Sapangdaku bridge, a sense of comfortable familiarity washed over us even though it has been quite some time since we walked on this trail. Now, that was quite unusual—at least for us—considering that this trail that leads to Mt. 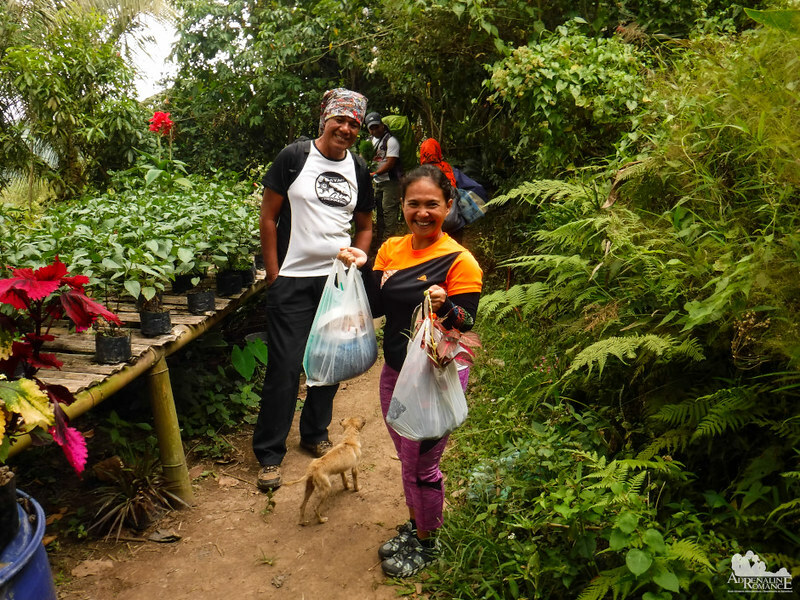 Babag is incredibly popular among Cebuano trekkers. But rather than turning right to Mt. Babag, Sir Jing turned left on a trail which we’ve never walked on since we started trekking over a decade ago. Suddenly, the discovery of something new evoked flames of excitement. 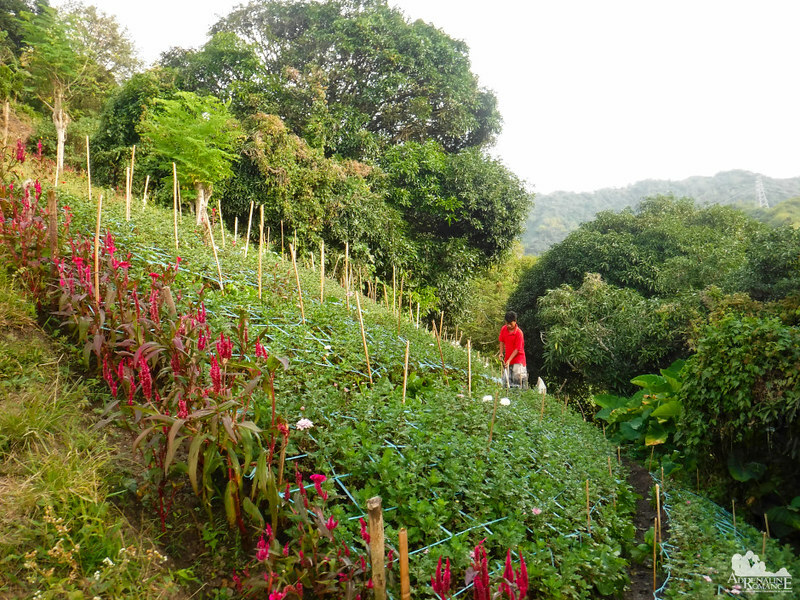 Like many places along Babag Ridge, these slopes are home to large and small flower farms tended diligently by locals. The high altitude, as well as the nutrient-rich loam soil of the mountain, make these places conducive for growing these beautiful flowers. Check out the incline of the slope. Yes, it’s that steep! And it’s just 10 minutes into the trek! The flowers that you give to your sweetheart? The flowers that are used to decorate wreaths during special occasions? The flowers that adorn your vase? 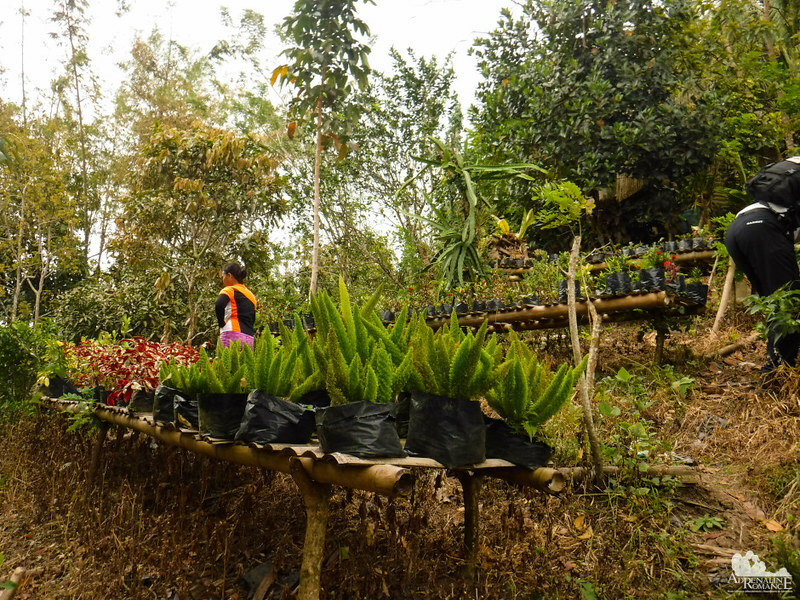 Those are painstakingly grown and cared for by locals. The beauty of these blossoms sometimes warrant a high price in the lowlands—and rightfully so. However, locals earn a very thin margin on the sale of these flowers. We’re not sure how the floral business works, but we believe there are middlemen involved. After passing by more flower farms and some homes, the trail started to become steeper. Yes, we are talking about an inclination of about 45 to 50 degrees in a lot of places. From our vantage, the ascent seems never-ending. 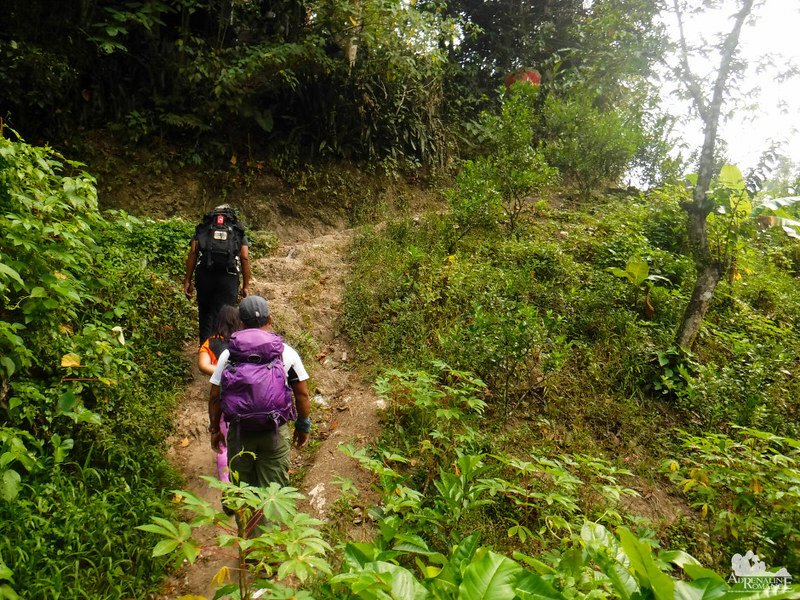 And because this is a practice climb for our upcoming Bakun Trilogy, we climbed on the trail as fast as our legs would allow. It was excruciating! “Be careful with this plant!” Sir Jing warned us. 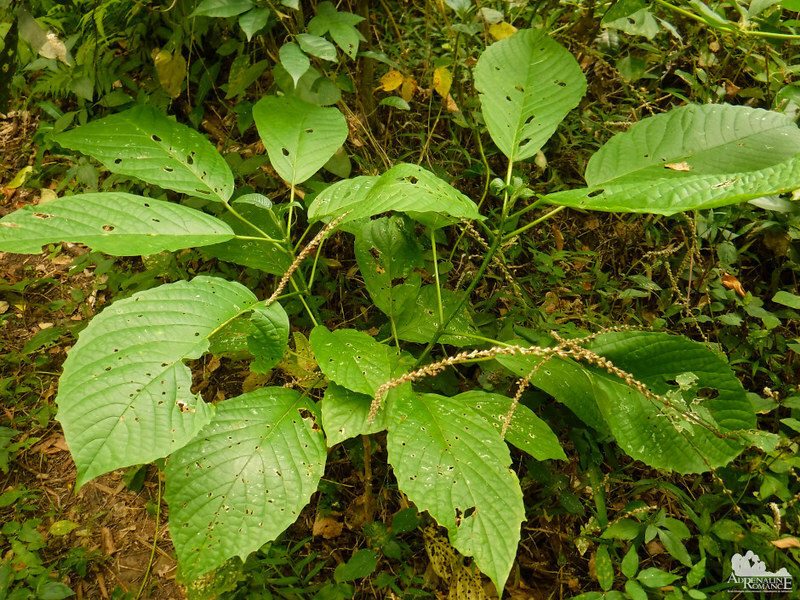 This shrub, locally called alingatong, may look harmless, but the leaves are actually covered with very fine, sharp hair that is easily dislodged when one brushes them. The hairs cause severe itching if they embed themselves in your skin. That’s why it’s always best to wear a good pair of trekking pants. It serves as your leg armor against plants like these. We have been climbing for about an hour along the trail, not seeing an artifact of modernity. 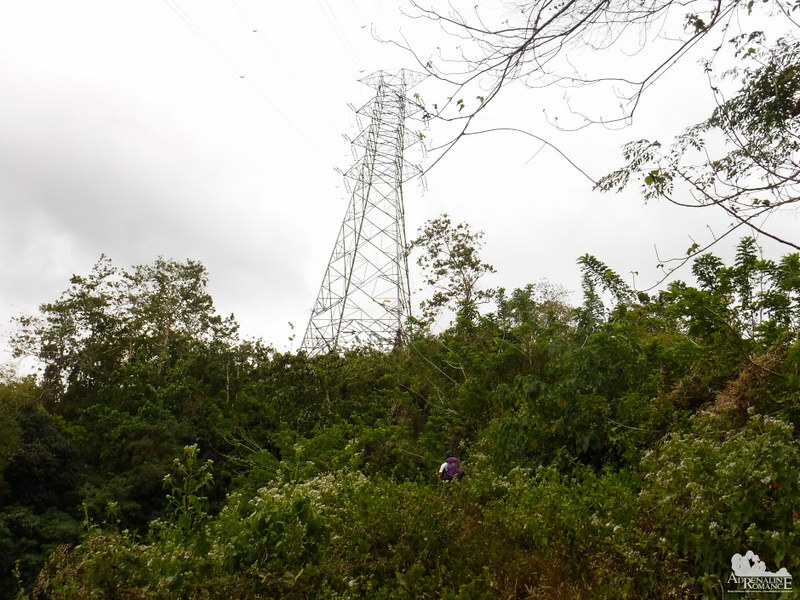 Suddenly, as we emerged from the woods, we saw this hulking electrical tower humming with high voltage—the first of several that we encountered during this trek. It was quite an oddity in the middle of the tree-covered highlands. 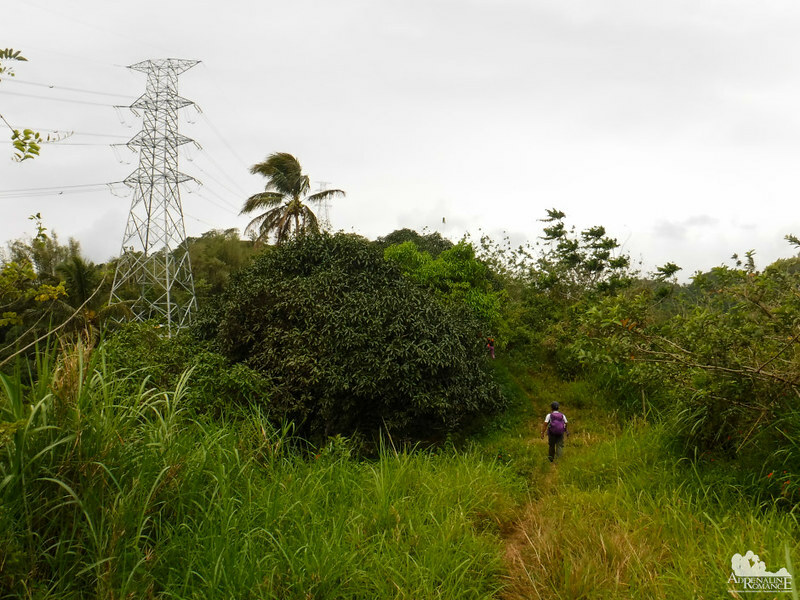 This is one of the nicest—and most mysterious—sections of the Manggapares Trail. The light woods look like gnarled witches’ talons reaching for the sky. Locals who pass by this area sometimes “feel” something as if invisible hands are caressing them. Another electrical tower! Trekkers simply call this path the “Seven Towers” trail as it passes through seven humungous electrical towers. 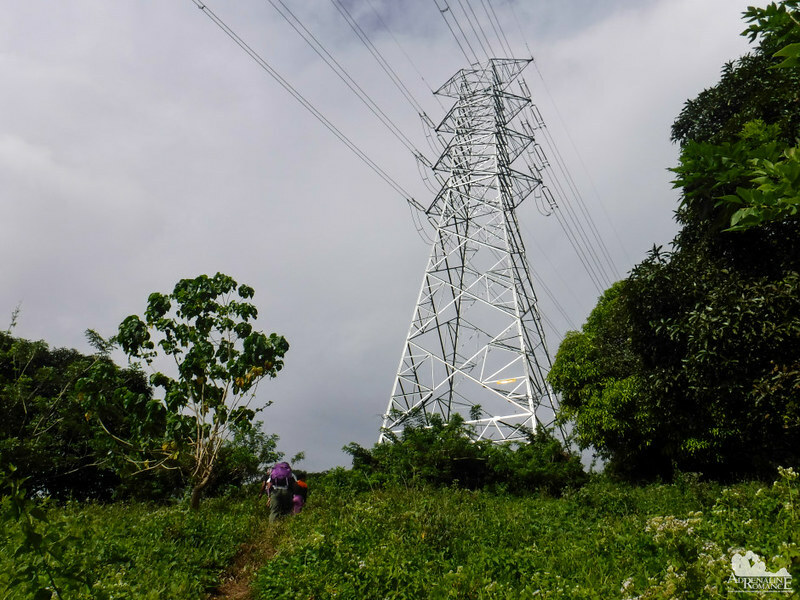 These towers connect power cables from the coal-fired power plant in KEPCO Naga to Cebu City. These towers feed electricity to a large grid of the metropolis. Yes, they look ugly in the wilderness, but without them, we wouldn’t enjoy modern conveniences. 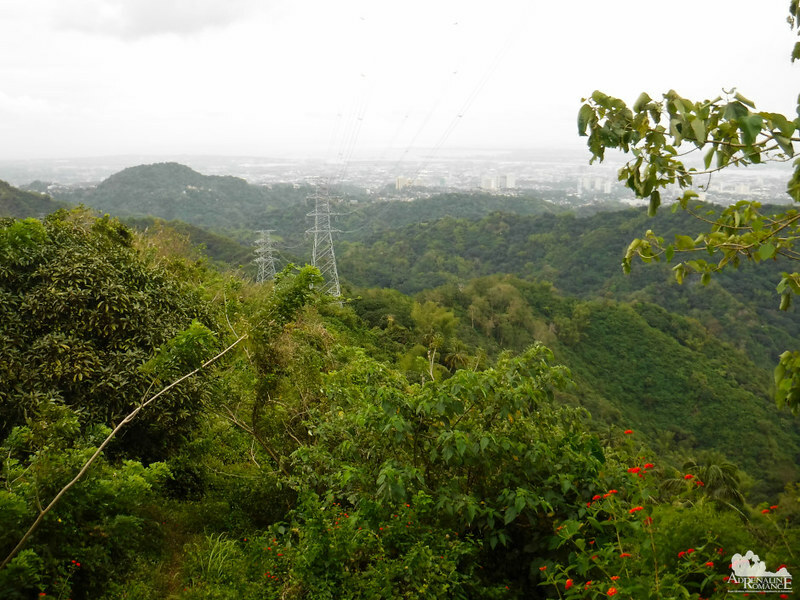 At times, the trail leading to Tagaytay Ridge ascends to an almost vertical angle. We had to stop, rest, catch our breath, and massage our the burning muscles of our legs. This trail beats any leg exercise in the gym! But it doesn’t matter. We may stop a while, rest for a few minutes, and survey the surroundings. But giving up? No way! Farther into the trail, we suddenly came across this lone, abandoned excavator. Who would think that there’s an excavator here up in the woods? It had been forgotten ever since. It became part of the landscape—a strange landmark of sorts. We lost track of how many towers we passed by. Haha! But I think this was Tower 6 of the Seven Towers Trail! Whoopee! That means we must be nearing our destination, right? “Nope,” Sir Jing simply said and gave us a wistful smile. Although we were the only souls today walking along this part of Tagaytay Ridge, it was evident that locals frequent this place. Livestock like these cows roams freely in the mountains, content on chewing leaves and branches. This curious calf approached me while his wary mother stood guard with ever watchful eyes. One wrong move and she’ll definitely ram us with her bovine head. A little over a mile away, we could see the communication towers that mark the summit of Mt. Babag. 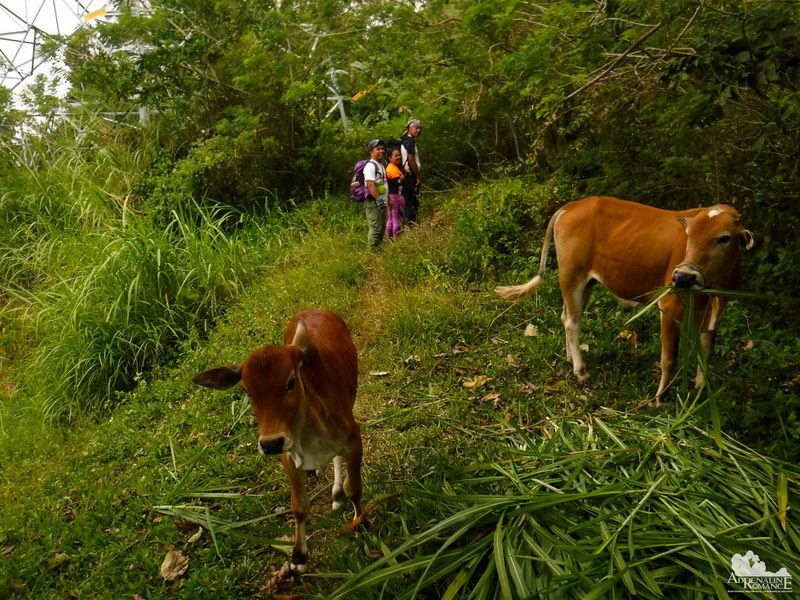 Cebuano trekkers regard the trail from Napo to the peak of Mt. Babag as a training ground for major climbs. 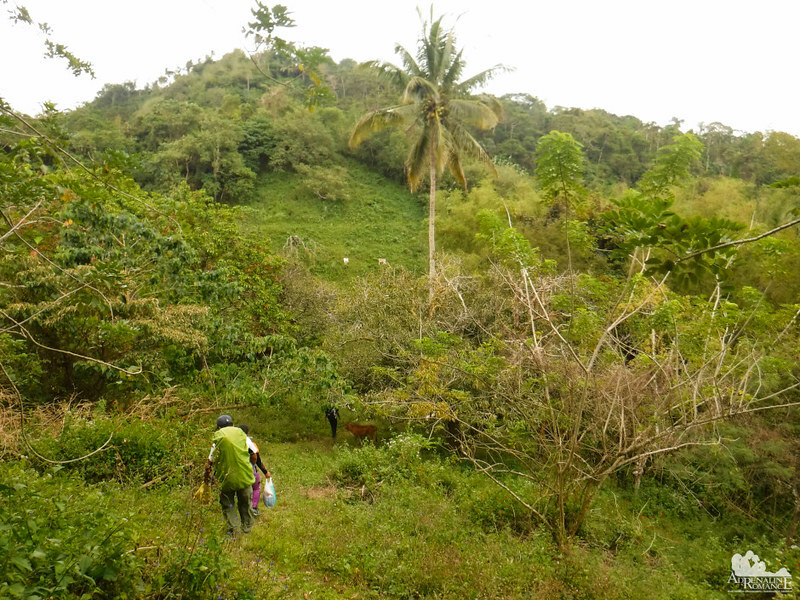 The Manggapares Trail, however, is way steeper. The incline is nonstop until the top of the ridge! 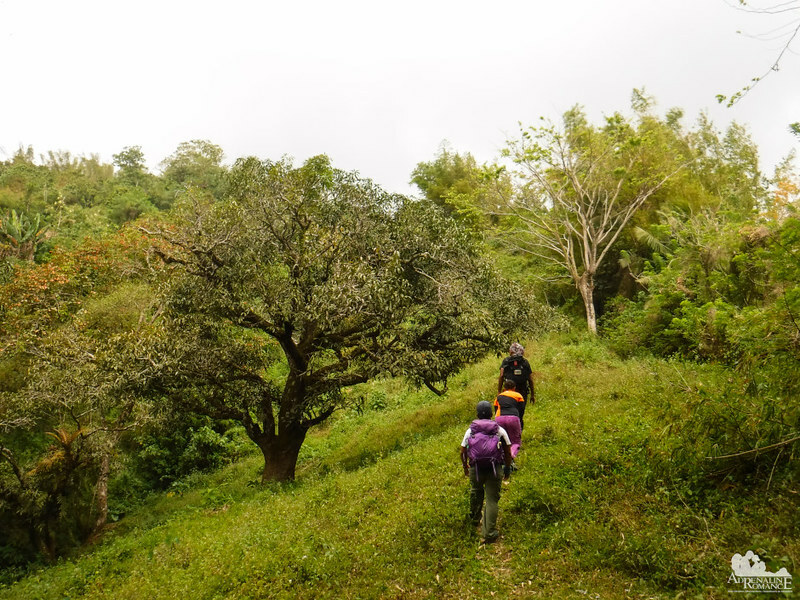 The Manggapares Trail literally means “a pair of mangoes.” It is named so because it once straddled two large mango trees. Today, only one was left standing; the other fell to reasons lost in time. Curiously, this remaining mango tree hasn’t bloomed for years. Four hours after we started our ascent up Manggapares Trail, we found another oddity. 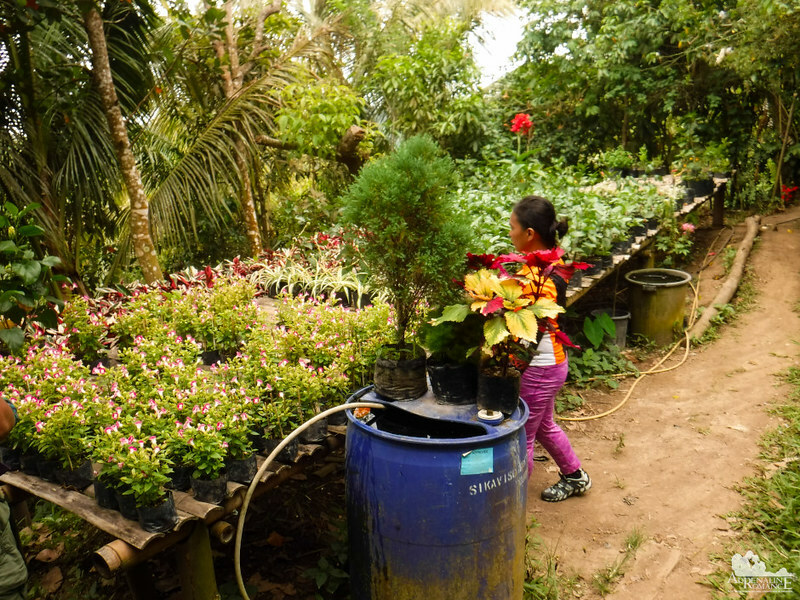 In the middle of the woods, we found this small, privately owned farm for ornamental plants. Sir Jing said that this was where we’ll take our lunch! Wohoo! It’s about time coz we’re ravenously hungry! Many of these ornamental plants cost a fortune in the lowlands. 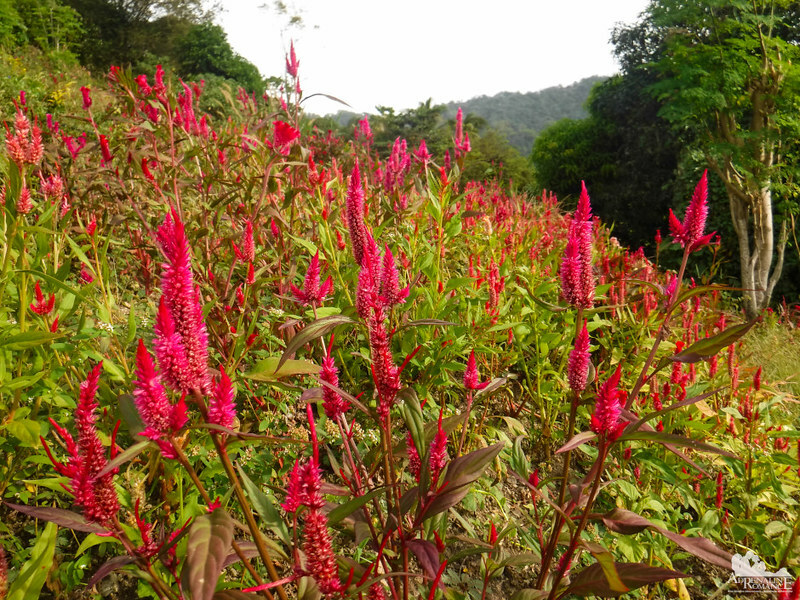 But for the farmers that nurture these beautiful flora, they rarely get to experience that fortune. The profit is razor thin, and their diligent effort is usually disproportionate to their rewards. Right here at the source, the plants cost a penny. Sweetie and Halourd are both fond of house plants, so they chose some that they could bring home. Yeah, our practice climb suddenly turned into a shopping spree. 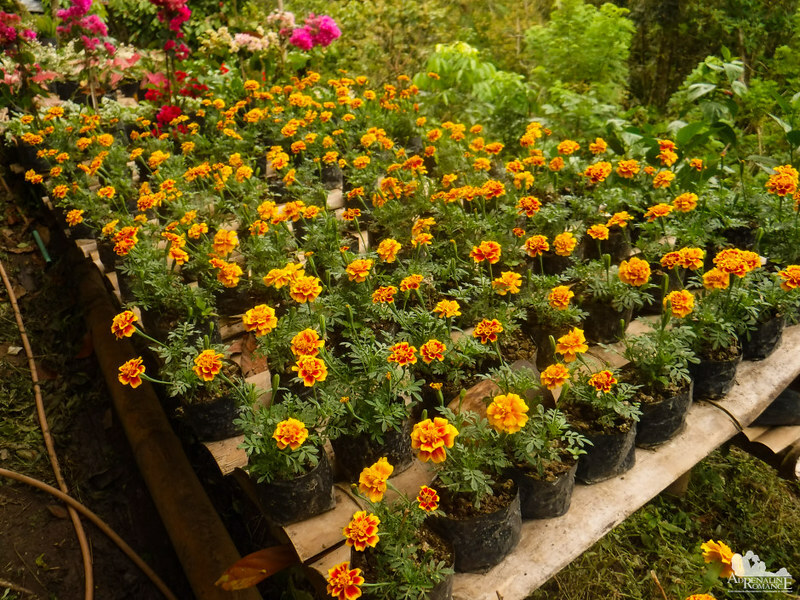 Do you want these flowers growing in your garden? We don’t know about you but we definitely do! They add a whole lot of color and vibrance. The farmers have other plants in their plot. 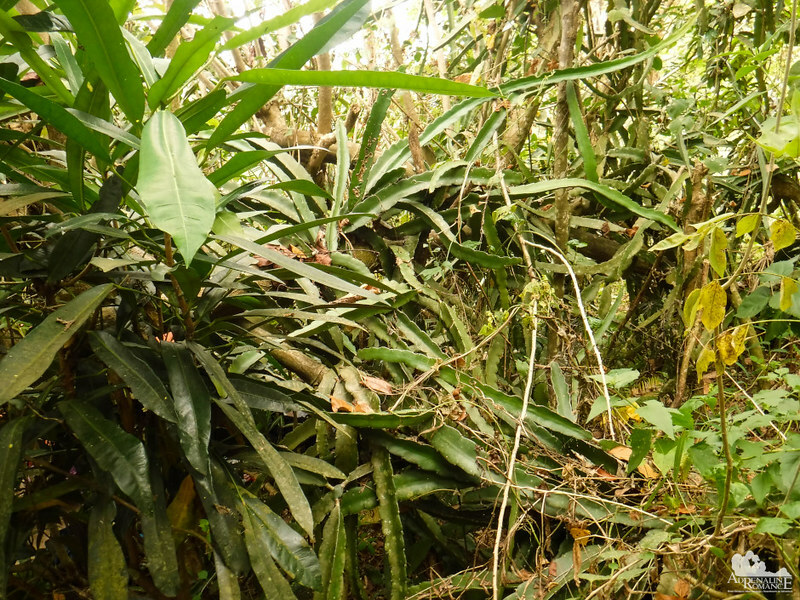 For example, tucked behind their shed are the thick, meaty leaves of the native dragonfruit. When ripe, the dragonfruit tastes really sweet. We tried a dragonfruit shake once when we were in Vigan. It’s super delightful! 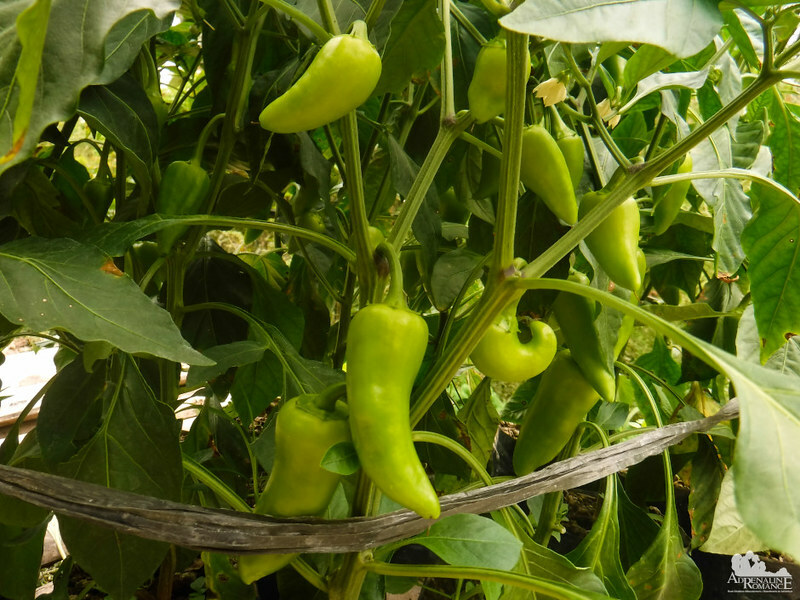 Along with flowers, the family also grew peppers. We plucked some fresh ones to spice up our lunch. What was our lunch, you might ask? Well, it’s Sir Jing and Halourd’s version of adobo! 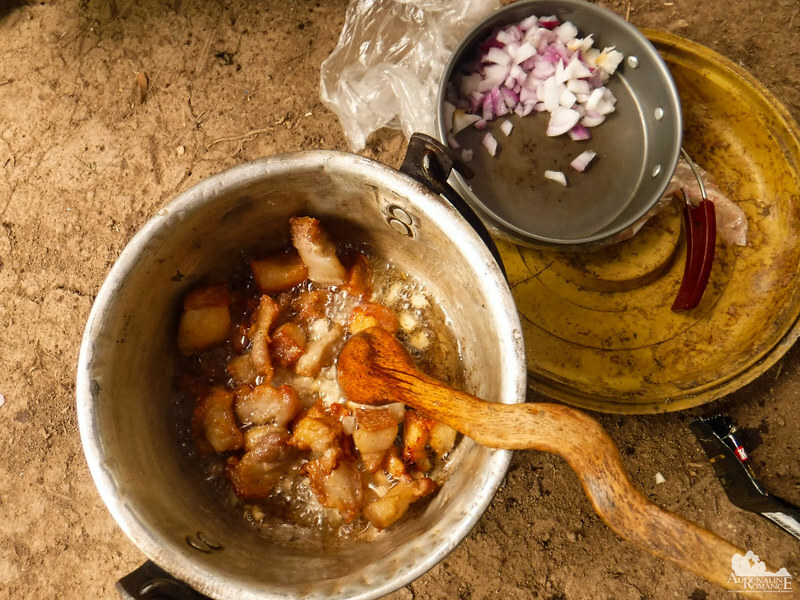 They rendered pork chunks to cook the meat in its own oil. Freshly picked peppers and onions were added to the mix. Finally, they poured some soy sauce as a marinade. The dish was simmered until most of the soy sauce evaporated. Together with boiled rice, this adobo lunch was dynamite! The kind owner also gave Sir Jing a small homemade bolo. Check out the handmade carvings on the scabbard. Sir Jing was definitely ecstatic as he is an avid knife collector. And Sweetie—along with Halourd—got their plants, and it’s time to continue the trek! But it was impossible to put them all the plants we bought in our daypack. Since Sweetie and Halourd have to carry the foliage in plastic bags, it would be very inconvenient for them to continue our trek. Thus, with permission from Sir Jing, we agreed to end the dayhike and exit the mountain so we could carry our prizes back to the lowlands. After bidding the family goodbye, we took a dirt trail that led to our alternative exit point. It’s quite amazing to realize that locals think of these trails as nothing more than networks that lead them around the neighborhood. On the other, we, visitors and trekkers, view them as gorgeous pathways that allow us to witness Mother Nature’s beauty. 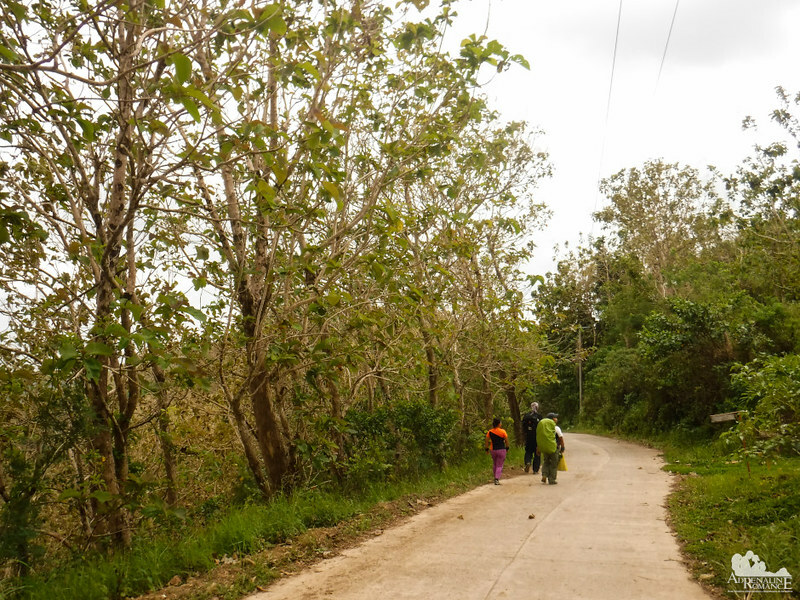 A quarter of an hour later, we reached a concrete road that lead to Barangay Pamutan where we took a mid-afternoon snack and waited for a habal–habal ride home. As you can see, sometimes, our outdoor activities sometimes don’t go as planned. But whatever happens, we know that we get something out of them—whether they are simple prizes, new friendships, or a cascade of learning. 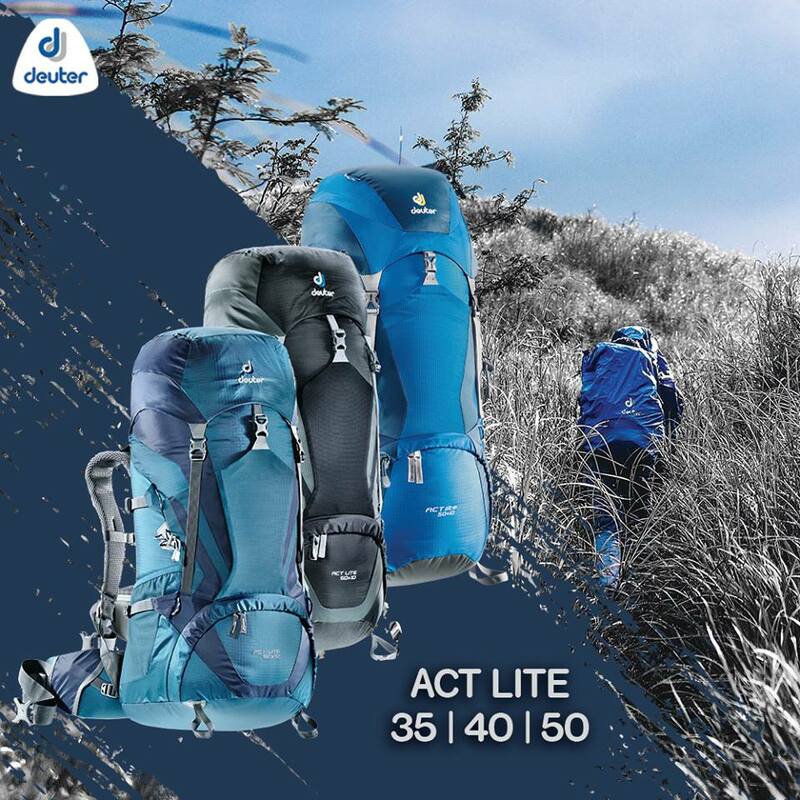 Hike on! 1. For guideship services, look for Jing Lavilles de Egurrola (a.k.a. 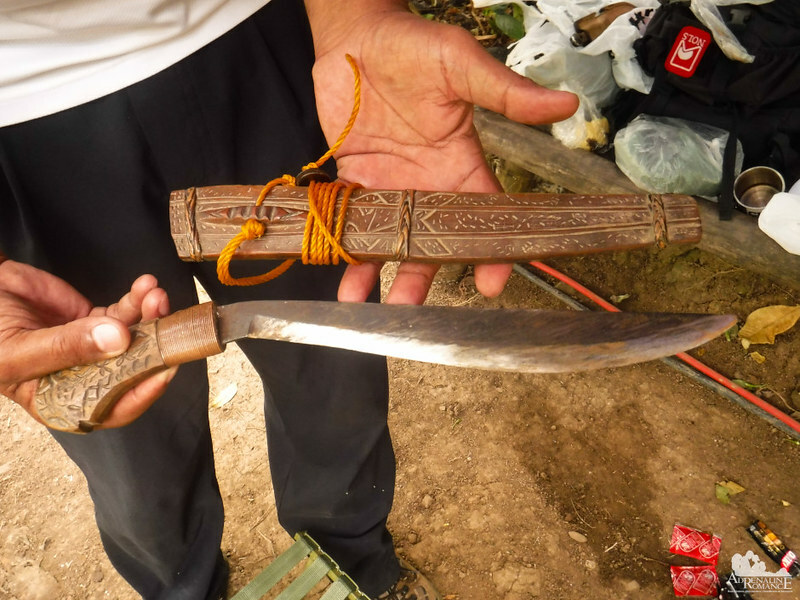 PinoyApache) of Camp Red, the only bushcrafting organization in Cebu. Mt.Babag is Camp Red’s backyard and Sir Jing can definitely show you the secrets of the place. 2. 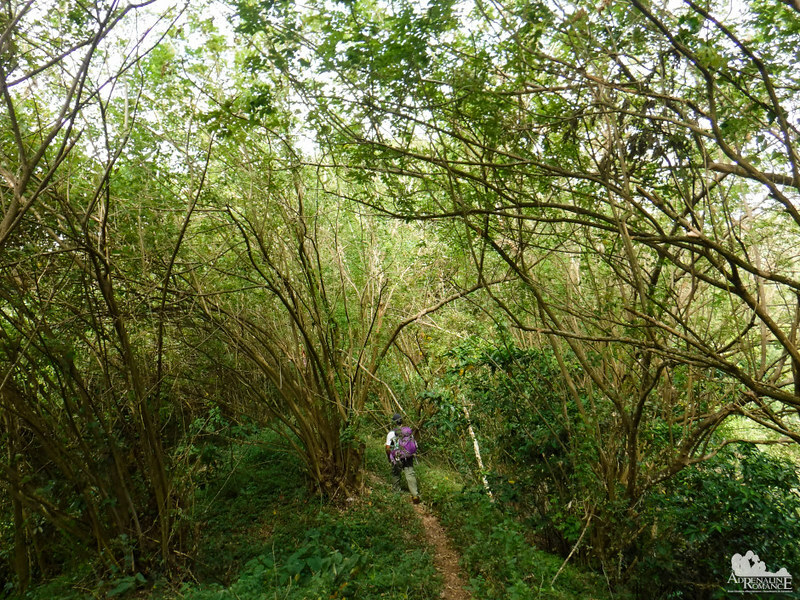 The best time to climb the Manggapares trail for day hikes is early morning when the sunshine is still gentle. 3. Don on good trekking shoes with an aggressive tread. You will need the shoes for traction due to the loose soil that characterizes Babag Ridge. 4. Wear arm guards and leg guards since the plants are vicious. 5. Take salt tablets or beverages that are filled with ions (e.g. Gatorade, coconut water, etc) besides water. The hot sun and the brutally steep ascent can squeeze the fluids off you. When you lose enough ions and salts through your sweat, cramps will occur. 6. Bring energy-rich trail food such as nuts, crackers, bread, and bananas. 7. 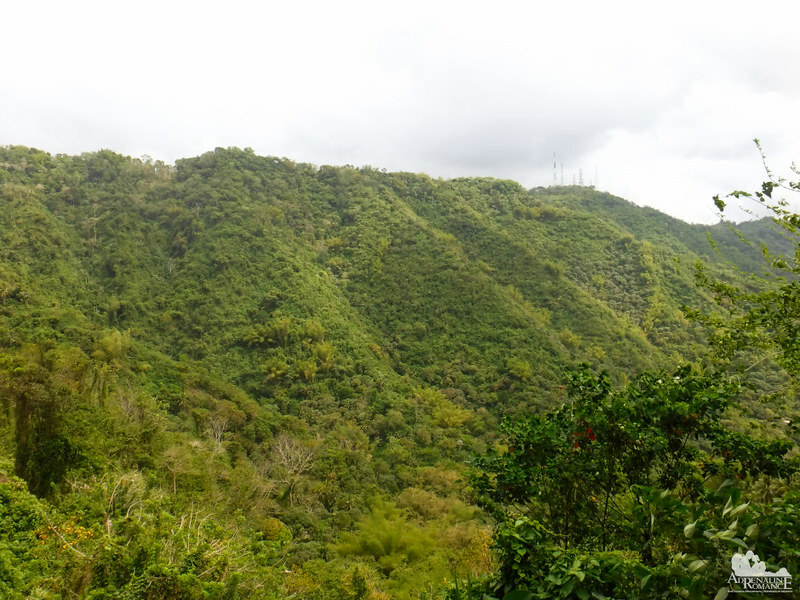 Note that the Manggapares Trail is extremely steep, with 45 to 50-degree inclines on some places. Keep a steady stride, and match the rhythm of your breathing to your pace. Don’t hesitate to ask your guide to stop; even the strongest mountaineers’ stamina gets drained here. 8. Help local flower farmers. Buy directly from them and don’t haggle. Wow, look at that ridge! It’s beautiful! 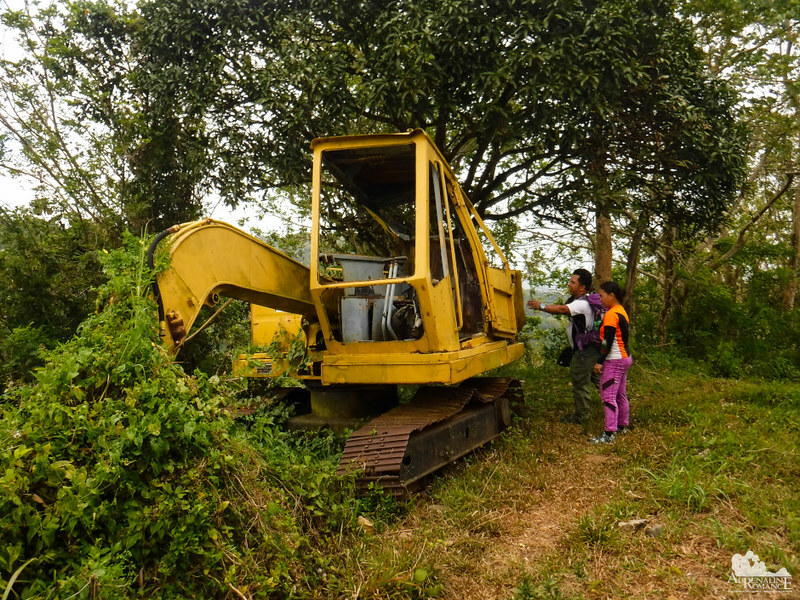 Plus, that sight of the backhoe reclaimed by nature is a reminder that nature always have the upper hand. This looks like a tough trek to me. Such steep inclines. But I would do it for those beautiful flowers. And the sight of that excavator in the middle of nowhere! Why that was interesting! Well, it’s not exactly THAT tough. But the steep, never-ending incline is a great challenge. Perfect for exercise. Hahaha! The flowers are really nice as well. They are inexpensive when bought from the highlands. There are plenty of flower fields on the lower slopes of this range. Very pretty to look at. The incline is definitely steep, but you can make it. Hehehe! Looks like a great climb. The scenery is beautiful. It’s a good thing you wore long pants, those plants sound quite painful! This looks like a pretty hike, given all the colourful flowers. Your lunch looked interesting too! Yup, we always wear long pants or leggings. Many of these plants have sharp thorns, and some are really itchy. The pants act as armor for us. I like hikes like that. Somehow, have been doing those mostly in Northern Europe, I think I am ready now for the new landscapes. If you have the chance, do try hiking the mountains in the Philippines. The tropics is very different from the Northern Hemisphere. That is steep! You must be in really good shape! This looks like a strenuous but pretty climb. That baby calve looks so sweet but mama looks a bit scary. Lol. Hahaha! Indeed, it is steep. Best workout for the legs. I always love reading through your adventure stories because it’s like I’m right there with you. Seems like you came across a lot of beautiful (and expensive) plants too. I’d definitely love to have a garden like the one in your photos as well. And that adobo sounds to die for!!!!! Thank you, Jas! Your compliment is an honor for us. Love the flora and fauna that you encountered on your hike! Absolutely stunning views. Thank you! 🙂 It’s a great weekend hike with nice scenery around. your post made me want to do there RIGHT NOW! It looks amazing and I am saving it for when I plan my trip there. fingers crossed hopefully I get to go next year!